If you are not a Canadian citizen or permanent resident, see the last section of this page. Lester B. Pearson International Airport (YYZ) is about 20km west of the Department. The Union Pearson Express connects the airport with downtown Toronto. Trains leave from Terminal 1 (if you arrive at Terminal 3, take the monorail to Terminal 1); they run every 15 minutes. Get off at Bloor, the second stop. Walk towards the back of the train, and then down the exit ramp and through the underpass. Follow the signs to Dundas Street. Cross Dundas Street (carefully!) and enter the subway (TTC), next to a McDonald's. Take an eastbound train to St. George Street (7 stops). When you get off, walk to the back of the train and exit the station onto St. George Street. Turn left and walk 75 meters to Bloor Street. To get to the Department of Economics (150 St. George Stree), walk 100 meters further along St. George Street. The total travel time is around 50 minutes and the total cost is between $8 and $9, depending on your means of payment. 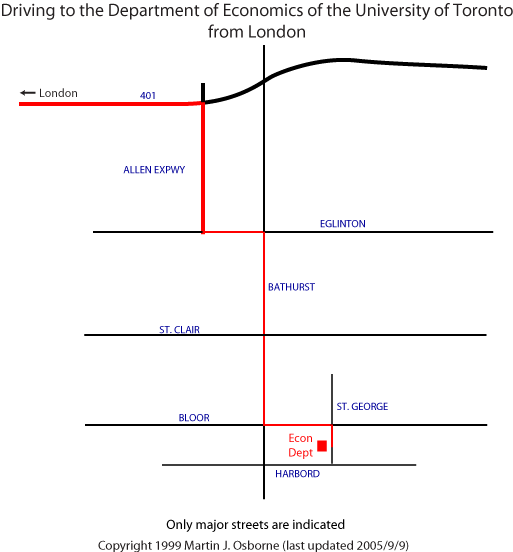 You can alternatively take the 192 Toronto Transit Commission (TTC) bus from the airport (from either Terminal 1 or Terminal 3) to Kipling subway station (the end of the line), then the subway to St. George Street. The fare is $3.25 (August 2017). (You pay when you enter the bus (exact fare, a token, or a Presto card required); no additional fare is required for the subway.) The trip takes 50 minutes to an hour. Departure times from Terminal 1 / Departure times from Terminal 3. Another option is a taxi. Taxis from the airport charge a flat rate, currently (August 2017) $57 to the Department of Economics). (Rates are available in this file. The department is in the area between Bathurst, Bayview, the QEW, and Bloor.) Limos are also available. The vehicles used by airport taxi and limo companies are pretty much the same; limos charge about 10% more than taxis. Travel time between the airport and Department of Economics varies widely, depending on the time of day. In the absence of traffic (e.g. very early in the morning), the trip should take about 30 minutes. At peak times, it may take more than an hour. Trips to the airport may be arranged in advance by calling an airport taxi company. Alternatively, you may take a regular city taxi to the airport. If you do so, you have the option of negotiating a flat rate with the driver before you set off. If you negotiate a flat rate, the driver is required to put the meter on and charge you the lesser of the flat rate you negotiated and the charge on the meter. Most taxis and limos accept credit cards. Billy Bishop Toronto City Airport (YTZ) is on an island just south of downtown Toronto. To reach the Department of Economics, you can take a shuttle bus to Union Station and then take the University line (Line 1) subway north to St. George, or you can take a taxi. If you take the subway, when you get off at the St. George stop, walk to the back of the train and exit the station onto St. George Street. Turn left and walk 75 meters to Bloor Street. To get to the Department of Economics (150 St. George Stree), walk 100 meters further along St. George Street. Union Station in Toronto is connected to the subway. 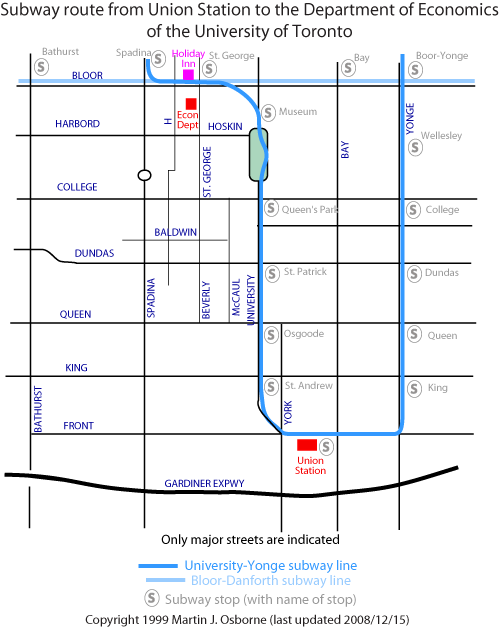 Take the University subway line (Line 1) north from Union Station to the St. George station. When you get off at St. George, walk to the back of the train and exit the station onto St. George Street. Turn left and walk 75 meters to Bloor Street. To get to the Department of Economics (150 St. George Stree), walk 100 meters further along St. George Street. 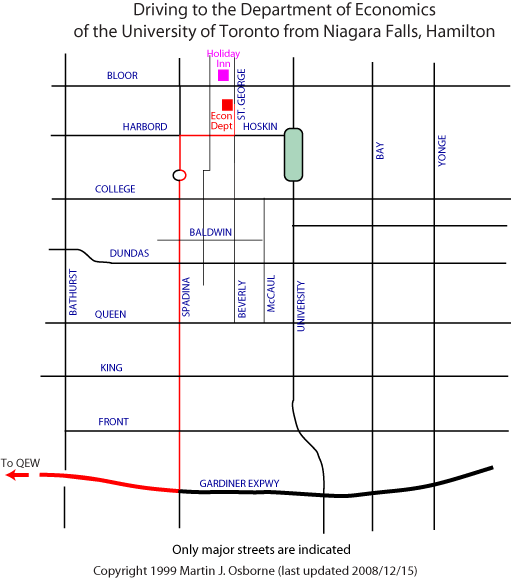 Map of subway route to Department of Economics. Take Highway 401 into Toronto, and then exit onto the Don Valley Parkway. Drive South for about 10 km and exit at Bloor St. Turn right onto Bloor, and continue west. After about 3 km (you will pass major intersections at Yonge St., Bay St., and Avenue Road) you will reach St. George. The Department of Economics is a half a block south, on the right. 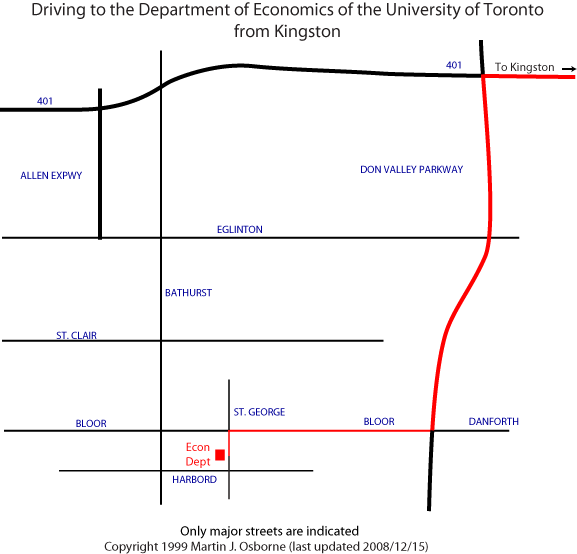 Map of route to Department of Economics from Kingston. Take Highway 401 into Toronto and then exit onto the W. R. Allen Expressway, South. After about 4 km, the expressway ends at Eglinton Avenue. Stay in the left lanes and turn left on Eglinton. Follow Eglinton to Bathurst (about 2 km.) and turn right on Bathurst. Follow Bathurst south for about 4 km., past St. Clair and Bloor, to Harbord (the second light south of Bloor). Turn left on Harbord and continue east across several city streets to Spadina and then St. George. Turn left on St. George. The Department of Economics is a block and a half north, on the left. Map of route to Department of Economics from London. Take the QEW (Queen Elizabeth Way), which becomes the Gardiner Expressway in Toronto. About 15km. past Highway 427, exit north on Spadina. Continue north on Spadina for about 3km. to Harbord Street, passing Queen, Dundas, and College. Turn right on Harbord, then left two blocks later on St. George. The Department of Economics is a block and a half north, on the left. Map of route to Department of Economics from Hamilton. If you are staying at a hotel, use its parking facilities. If you are at the Department of Economics for a day, ask someone in the department before you visit.